Important note: Depending on your telescope, this eyepiece may provide magnifications that are too high! While it can be very useful for viewing the Sun, Moon, brighter planets and terrestrial objects, it is not for everyone or for common viewing conditions. 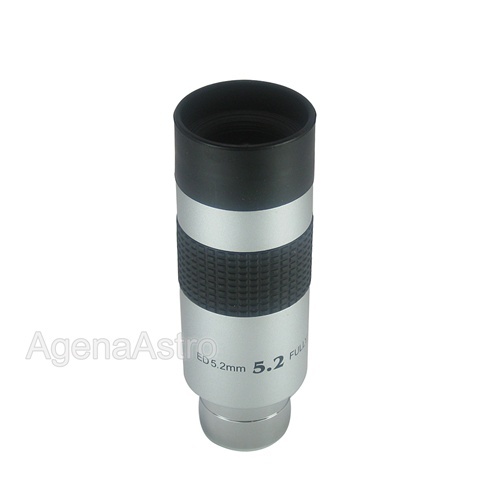 Before buying, please make sure that you are using realistic magnifications with your telescope. A good rule of thumb is that under very good conditions and with a very good telescope, the maximum power you will be able to use is about 50x of magnification per inch of telescope aperture. With average telescopes and/or average conditions, you might be limited to 30x of magnification per inch of telescope aperture. So for example, if you have a 4" telescope, under typical conditions you might typically use 4x30 = 120x of magnification, and 4x50 = 200x of magnification at best. If your telescope has a focal length of, say, 1200mm, then this eyepiece will result in a magnification of 1200 / 5.2 = 231x which is probably too much for this telescope. Review by Joel of Colorado. I just got back from my observing session with this eyepiece. I viewed through an Orion XT8 Classic Dobsonian. Because of poor weather, I only got a chance to look at the Orion nebula and the Moon. I had excellent views of the Trapezium and clearly discernible nebulosity, in spite of light pollution and some cloud obscuration. The Moon was unbelievable. Amazingly crisp and sharp images. Used the 2x Barlow with it and it was still pretty good, but this took me to 560x, way past the theoretical max magnification for my scope. I highly recommend this EP.